At least eight civilians were killed in Saudi-led airstrikes in Yemen's southern province of Taiz on Thursday, medics and witnesses said. "Eight workers were killed and 16 others wounded when their bus was hit by shrapnel and overturned in the airstrike," a doctor from Taiz's Hoban hospital told Xinhua news agency. 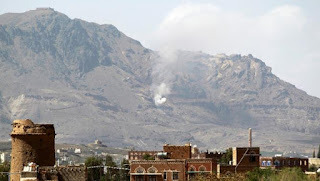 Witnesses said the airstrike hit a checkpoint run by Shia Houthi group in Hoban area while the bus carrying the 24 workers to their factory was driving by.A security source said that "all Houthi fighters manning the targeted checkpoint, more than 15 fighters, were killed on the spot".On Wednesday, 41 Houthi fighters were killed in the Saudi-led airstrikes and battles against pro-government forces.